Whereas rodents have gnawing incisors that grow throughout their lives, the teeth of shrews gradually wear down like human teeth do. They have a higher metabolic rate than any other animal. The heart of the masked shrew, Sorex cinereus, beats 800 times a minute, considerably faster than that of the hummingbird. Shrews must eat 80-90 % of their own body weight in food daily. Most will starve to death if deprived of food for half a day. They eat anything available, but prefer small animals; they are economically important as destroyers of insects and slugs that harm crops. Shrews are easily startled and will jump, faint, or drop dead at a sudden noise. 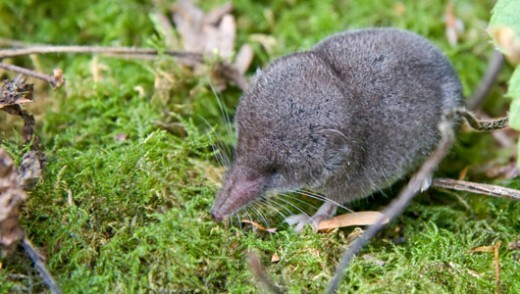 The Etruscan Shrew (Suncus etruscus) which at about 3.5 cm and 2 g is the smallest living terrestrial mammal. Unlike most mammals, some species of shrew are venomous. Shrew venom is not conducted into the wound by fangs, but by grooves in the teeth. The venom contains various compounds and the contents of the venom glands of the American short-tailed shrew are sufficient to kill 200 mice by intravenous injection. Habitat: In general, shrews are terrestrial creatures, but some specialise in climbing trees, living underground, in or under snow and even hunting in water. Range: Shrews are distributed almost worldwide: of the major tropical and temperate land masses, only New Guinea, Australia, and New Zealand do not have native shrews at all.